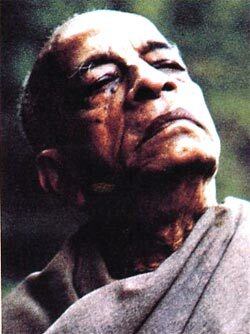 Disciple: Srila Prabhupada, when we try to show people that they’re spiritual beings, it’s awfully hard for them to see. And when we explain how the soul transmigrates from one lifetime to the next, from one body to the next—sometimes it’s next to impossible for people to see. Srila Prabhupada: Yes. Transmigration—how can it be shown? How can it be seen by the naked eye? Even the mind, intelligence, and ego you cannot see; although they are material, they are so subtle that you cannot see them. And what to speak of the soul? But for instance, though you cannot see my mind directly, you can see its activities. In this way you can see my mind. Therefore you have to accept its existence. And though with these limited material senses you cannot see my soul, or spiritual form, still you can see my soul acting in so many ways. Therefore you have to accept the existence of my soul. Another example. All around you here, you have the sky, the ethereal element. But you cannot see it. So where is the proof that the ethereal element exists? [Claps.] That you cannot see with your eyes. But you can hear it with your ears. Sabda, sounds—sound is the proof of the existence of the ethereal element. You cannot see the ethereal. But it is there. Sound is the proof for the presence of the ethereal element. And to prove the presence of the soul—which is much, much more subtle than the ethereal element—again you must rely on sound. You need to hear from spiritually realized persons and authoritative scriptures. Disciple: So with these limited material senses, we can perceive the soul only indirectly? Srila Prabhupada: That’s all. To perceive the soul—which is far, far beyond your perceptive power—you need the shruti, the authoritative scriptures. Sruti means “what is heard”—from the Lord and from spiritually realized sages who know about the existence beyond matter. So you have to get your perception of the soul by hearing from the bona fide spiritual authorities. That is knowledge. Otherwise, who has seen the soul with these paltry eyes? These modern rascals—who among them has seen the soul? They are educated so grossly. But everything can be perceived. Not that everything has to be seen with these eyes. We often give this example: as a newborn infant, you cannot determine who is your father simply by your eyes. You have to hear your mother reassuring you, “Here is your father.” That’s all. You cannot make some experiment through your seeing power. You simply have to hear from your mother, the bona fide authority on the subject of who is your father. You have to hear. That’s the proof. And the proof of the soul’s existence is sruti, what you hear from the spiritually realized authorities. Disciple: Srila Prabhupada, wouldn’t another proof be that everyone can, say, look at his hands and recall years earlier, when he had the hands of a baby or a young child? So everyone can figure out, “Now that my body is so totally different, my feeling of still being the same person has to be coming from my soul.” In other words, what stays the same is your soul. But at present the soul, who is a tiny spark of that undying spiritual nature, is being carried along by his materially covered mind and intelligence, and by his false ego. Now, when our gross material eyes see his body cremated, we may mistakenly think that he is finished, that everything, including the soul, is finished. The atheists will talk like this. Bhasmi-bhutasya dehasya kutah punar agamano bhavet: Once your present body is burnt to ashes, where is the question of your having come from a previous life or of your going to a next life? You are finished. So whom will you follow—the atheists? Why not follow Krishna? That is our proposal. Krishna says, “No. He is not dead. He has gone on to another body.” And dhiras tatra na muhyati: “Those who are sober are not disturbed by the outward show of the body’s death. They know the soul who lived within has now gone to his next life.” The real person is still living. He has simply gone from one dwelling place to another. But who can understand this fact? Only the sober, Krishna says. We have to become sober, cool-headed, and mature. Take the example of a restless child. Now, how can you convince this restless child about higher philosophy, the science of the soul? It is not possible. But a sober person, a cool-headed person—he can be convinced. So this is a childish civilization. It is not a sober civilization.